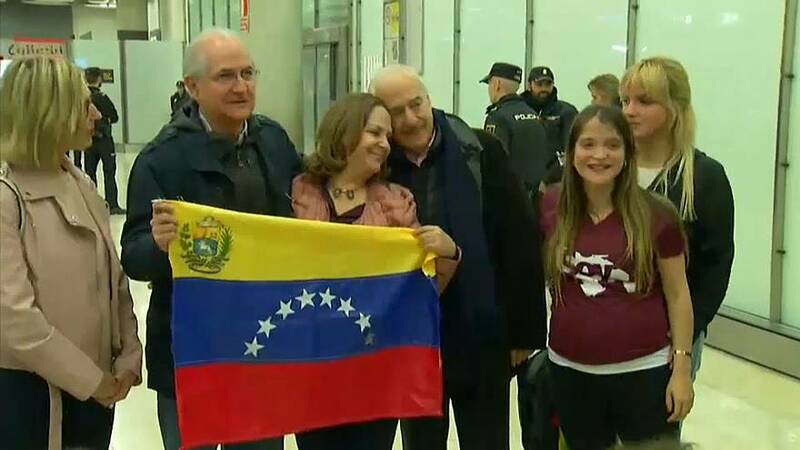 Antonio Ledezma, the ousted mayor of Caracas, was greeted by family members at Madrid airport on Saturday morning. One of Venezuela’s most prominent opposition leaders, he had flown from the Colombian capital Bogota to Madrid. “In Spain today I feel free,” he said at Barajas airport. He was cheered by supporters, who chanted the Venezuelan anthem. “Let’s not permit that Venezuela dies in our hands,” he also said, adding that he would soon meet with Spanish Prime Minister Mariano Rajoy. Ledezma had fled house arrest in Venezuela on Friday by crossing the Simon Bolivar bridge into Colombia. The 62-year-old former Caracas metropolitan mayor said he had gone past 29 police and army controls during a clandestine, overland journey that he kept secret from his loved ones. “They have suffered long hours of anguish without knowing where I was,” he told reporters in the Colombian border town of Cucuta after crossing a bridge from San Antonio in Venezuela. “Welcome to freedom!” tweeted former Colombian President Andres Pastrana, who is close to Venezuela’s opposition and the families of other jailed activists. The 62-year-old was removed as mayor of Caracas and detained in 2015 on charges of plotting to oust Venezuelan President Nicolas Maduro. After a few months in jail he was released and placed under house arrest due to health issues. Ledezma’s escape was an apparent embarrassment for security forces who had been keeping close watch over one of Venezuela’s most prominent opposition leaders. Ledezma was mocked by Maduro as “The Vampire,” and accused by officials of helping violent hardliners, including dissident military officers plotting to topple the president via air strikes. Ledezma said those charges were trumped up. “I hope they never send him back, they can keep the Vampire,” Maduro said on Friday evening. Before boarding a private plane to Bogota, Ledezma said he was planning a “global pilgrimage” to fight for political freedom in Venezuela. He thanked Colombia’s government, which also recently gave asylum to another high-profile Venezuelan dissident, former state prosecutor Luisa Ortega.